While my kids absolutely love their Elf on the Shelf, I don’t always love the message of “be good and receive gifts” that comes along with it. 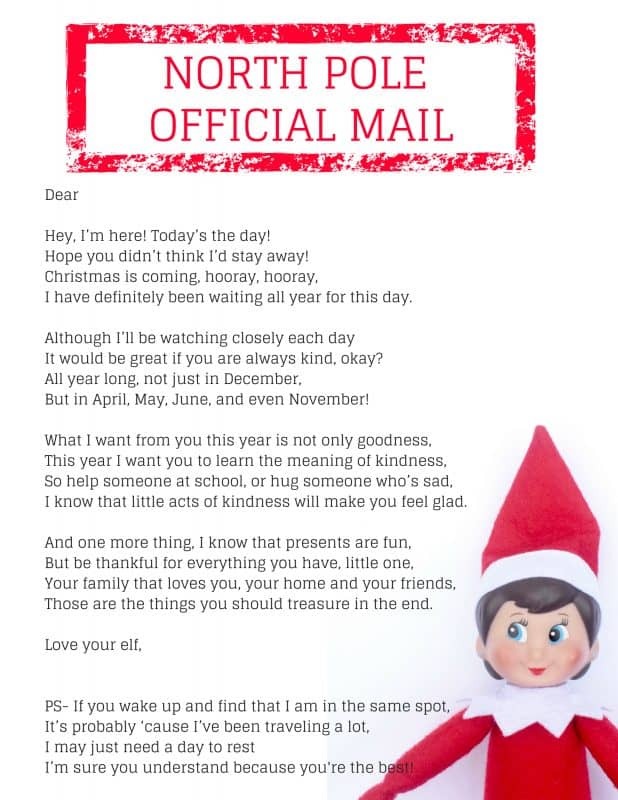 I created this Elf on the Shelf welcome letter to try to put the emphasis on kindness and thankfulness, and less on the material aspects of Christmas. Use these arrival ideas for the Elf on the shelf along with this Elf on the Shelf welcome letter with everything that you can find in my ideas for the Elf on the Shelf post, including elf names, easy, funny and toddler ideas and a goodbye letter. They will help your kids say, “Welcome back, Elf on the Shelf!”. Don’t have an Elf on the Shelf yet? Getting one on Amazon is the way to go because it’s quick and discreet! You can get a boy elf or girl elf. And I HIGHLY suggest getting this kit that makes your elf bendable. It’s a game changer. We all know that to a kid, the most important aspect of Christmas probably is the presents. And are we setting our kids up to be ungrateful people by including the Elf on the Shelf in our Christmas festivities? I say no! It’s not really different from the whole “he knows when you’ve been sleeping, he knows when you’re awake” thing. The elf is not the enemy. I love seeing my kid’s excitement every morning when they find her. It’s just about how you present the elf. I try to stay away from saying things like, “be good, Pony is watching!” Yes, our elf’s name is Pony. Because I don’t want my kids to be good just because an elf is watching from a shelf. I want them to be good because that’s what you’re supposed to do! However, this Elf on the Shelf welcome letter puts the emphasis off of the gifts. It mentions kindness. Kindness all throughout the year, which is what we should be teaching our kids. C’mon, Santa, why is December the month when goodness is necessary? This letter also talks about being thankful for everything that we already have. And super important for your sanity, this letter contains a special P.S. This P.S. tells your child not to worry when the elf inevitably forgets to move. I knew you’d like that one. It works for families who are just starting the Elf on the Shelf tradition, or for welcoming your elf back. I created two different designs, so you can chose the one you like best. Hey, I’m here! Today’s the day! Hope you didn’t think I’d stay away! I have definitely been waiting all year for this day. It would be great if you are always kind, okay? But in April, May, June, and even November! I can guarantee that little acts of kindness will make you feel glad. Those are the things you should treasure in the end. I’m sure you understand because you’re the best. 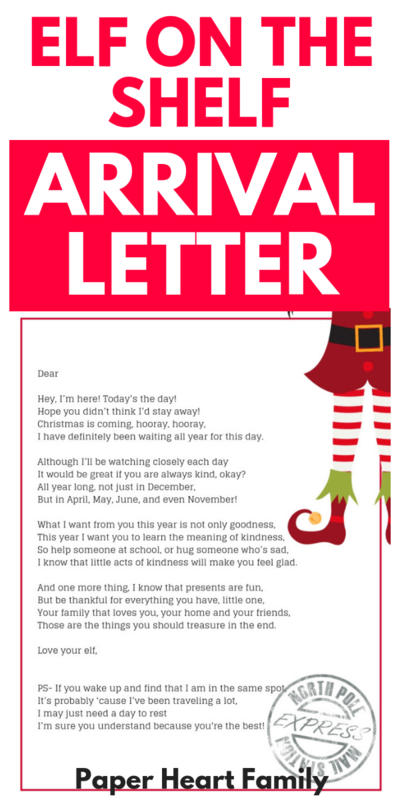 Simply enroll in our email list to receive both Elf on the Shelf arrival letter designs instantly. We’ve also got a Elf on the Shelf goodbye letter printable for the end of the month (which you should print NOW to save time later!). 200+Elf On The Shelf Names- With Elf Name Printable! You’re very welcome, Danielle! I hope your kids love it! Can I get the printable arrival letter for the elf please? I subscribed and still am not able to print. Okay Amy, I’m going to email you a link to the Elf on the Shelf welcome letter.